Alex Earle is the Design Program Manager for Volkswagen of America. But he’s passionate about bikes as well as cars—and in particular, street trackers. Road-legal customs with a go fast, turn left vibe are getting more popular by the day. 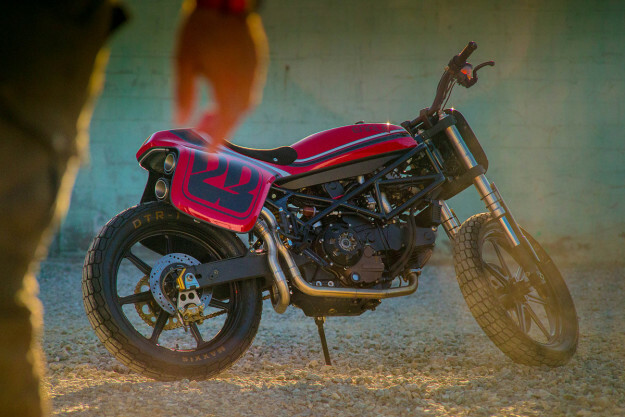 And Earle’s sleek Ducati Monster-based flyer is one of the best we’ve seen. 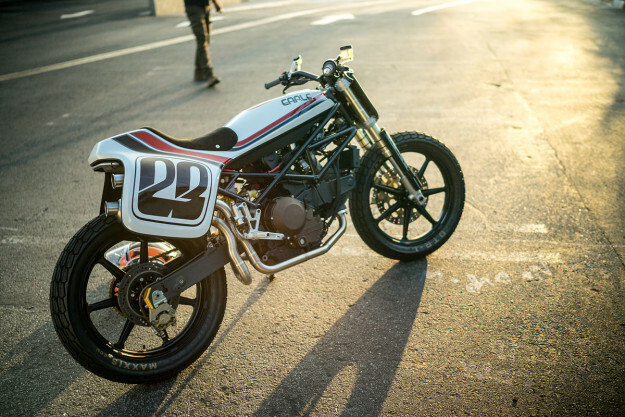 The concept is simple: A lightweight, modern-day street tracker with cutting edge carbon fiber construction. The stance is perfect, probably because Earle has used the same prototyping process as you’d find in an automotive studio. He made a 1:5 scale model from sketches, and then 3D scanned it. The data from the scan then went into a milling machine, which produced a mold for the bodywork. The result is a stunningly well-proportioned machine, and the dynamics match the aesthetics. Earle knows his stuff, and knows where to get that stuff made. 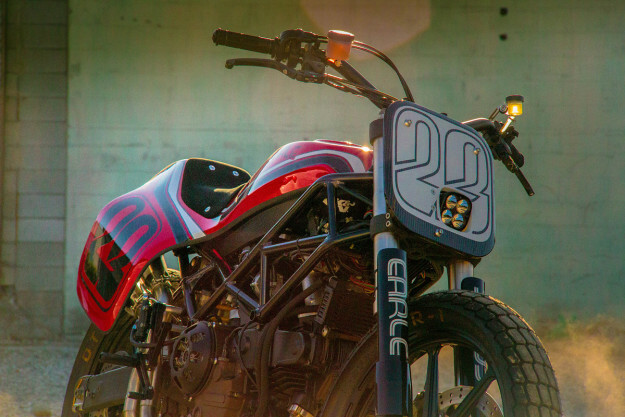 The first goal was to save weight: the Earle Motors Tracker tips the scales at just 345 pounds without fuel. That’s 157 kilos, or about the same as Honda’s superlight CBR300R. 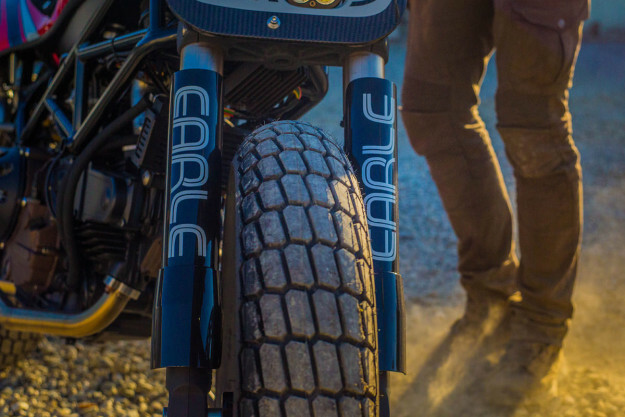 Earle has specc’d everything with weight saving in mind, from the LED lights to the 19-inch wheels, which are machined from billet. The seat is closer to ADV than sportbike territory though, with a commanding height of 34 inches. Vortex flat track bars, wide and swept-back, put the rider into an upright position—perfect for charging the canyons, supermoto style. 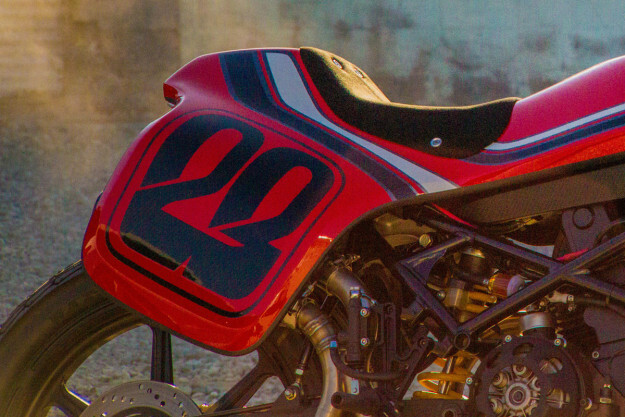 The monocoque bodywork is carbon fiber, with hints of a late 70s Montesa Cota. But the seat is resolutely modern: it’s upholstered with Niroxx, a lightweight and grippy suede-type material that’s also waterproof. 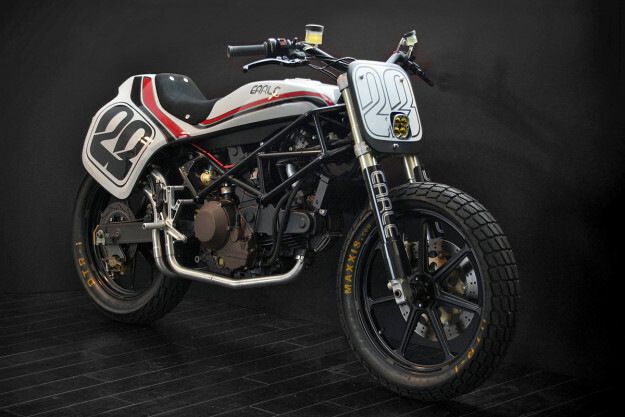 For engines, Earle uses Ducati’s 900cc air cooled, carbureted motors from the late 90s—as found in the Monster M900. Each motor is hooked up to an exhaust system tuned for maximum horsepower and constructed from stainless steel, with water jet-cut collars. 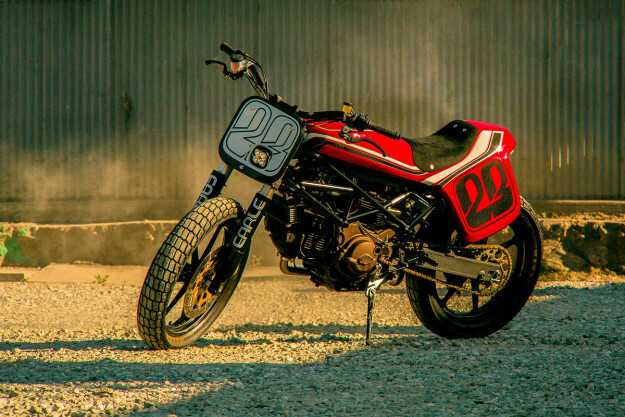 If you prefer more of a ‘retro superbike’ vibe, you can order the Tracker with 17-inch three-spoke wheels, and handlebars with reduced pullback. You’ll get what Earle calls a ‘road course bike’ with a much lower stand-over height. 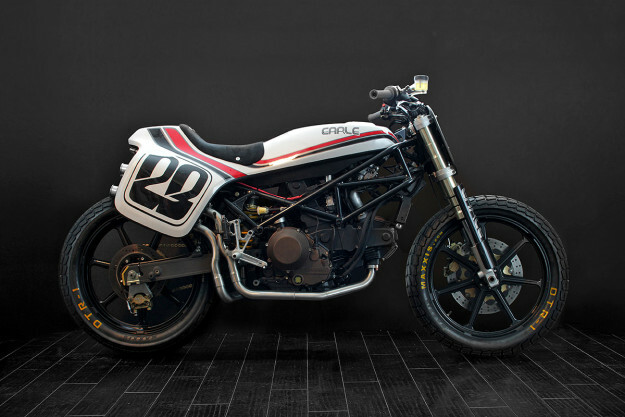 Earle has plans to build five bikes in this style. If you like what you see, drop him a line via the Earle Motors website.